I love them even better when you can eat them out of a cup. with a spoon. amazing. They're the perfect go-to dessert in my opinion. Who doesn't like brownies? I also just love the satisfaction I get from simply whisking together a few eggs, cocoa powder and a little flour, sugar and oil. It's so therapeutic and also a great arm workout. Surprisingly, I tend to be picky with brownies. I like them as plain ol' chocolate or with chocolate chips in them. I don't dig them with nuts. Am I nuts? No, I don't think I am. I just like what I like. When it comes to what goes on top of brownies...now that's where I can go nuts! I'm talking peanut butter, frosting, peanut butter frosting, Yes, peanut butter frosting. We'll get to that at a later date. Then there's caramel, marshmallows, whip cream, cool whip, powdered sugar and ice cream. I think I just gained 5 pounds just by typing that. I wanted chocolate last night and I wanted brownies. But I never made it to the food store and I didn't really want to use my oven. aka lazy. I had one egg left in the fridge. No good. So I of course googled "fast/easy brownies." For some reason after I typed in that phrase, I chuckled for a moment. As if brownies were that "slutty" clique in high school. Oh, you mean that thought didn't pop into your head for a moment either? Dang. Oh well. I relaxed most of the day in the sun. This fast brownie recipe was awesome! It turned out perfectly. 90 seconds is the longest you should go without overcooking it; unless you enjoy burnt brownie batter. 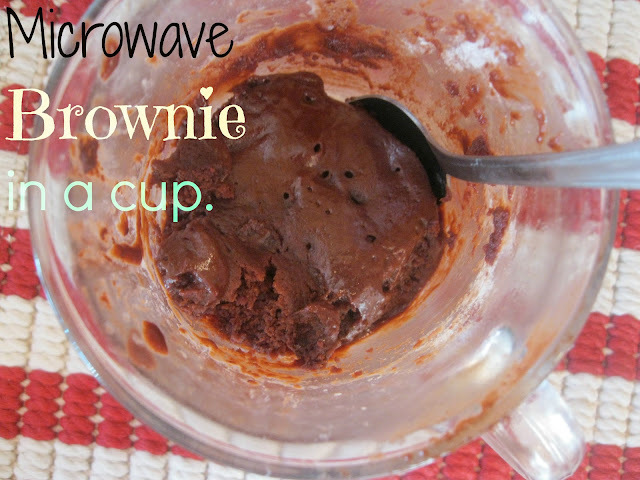 This was so easy and it cured my chocolate/brownie fix in no time. *I love that there's no egg in this. I love to eat the entire bowl taste any kind of batter. And as we all know, that's not the smartest thing to do. Salmonella, anyone? -I followed this recipe to a T! Do the same and you will not be disappointed. -I placed it in the microwave for about 70 seconds. 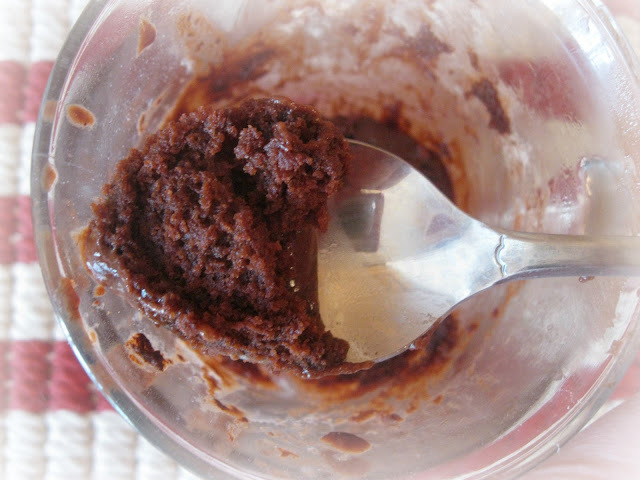 I still got brownie/cake-like texture with some of that gooey and yummy molten texture as well. Delish! Sometimes simple things can turn out to be so fantastic! Ha! Yes- it's very dangerous now that I know I can make this at ANY time! I love an easy brownie recipe!! And I love nuts in mine ;) But I also love tons of frosting and sprinkles. Sprinkles always make brownies better!